Note to Lamare from Eric Dollard-Glad you like my complex algebra paper. The “square root of minus one” was taken away from the parrot here! Philo Farnsworth started me on that project in 1980. He stated that I should develop a Steinmetz type of Versor (AC) operator adapted to hyperbolic rather than circular functions, hence a versor (I.C.) operator. 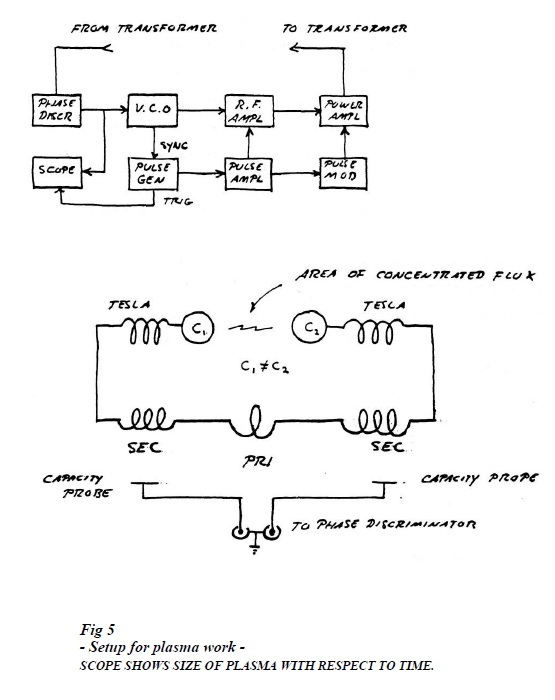 Philo stated this as the “Holy Grail” of “Theoretical Electrical Engineering”. He then started it off by giving me a book “Physics and Mathematics in Electrical Communication”, Perine. It took me 8 years until I finished “Symbolic Representation of the Generalized Electric Wave”. 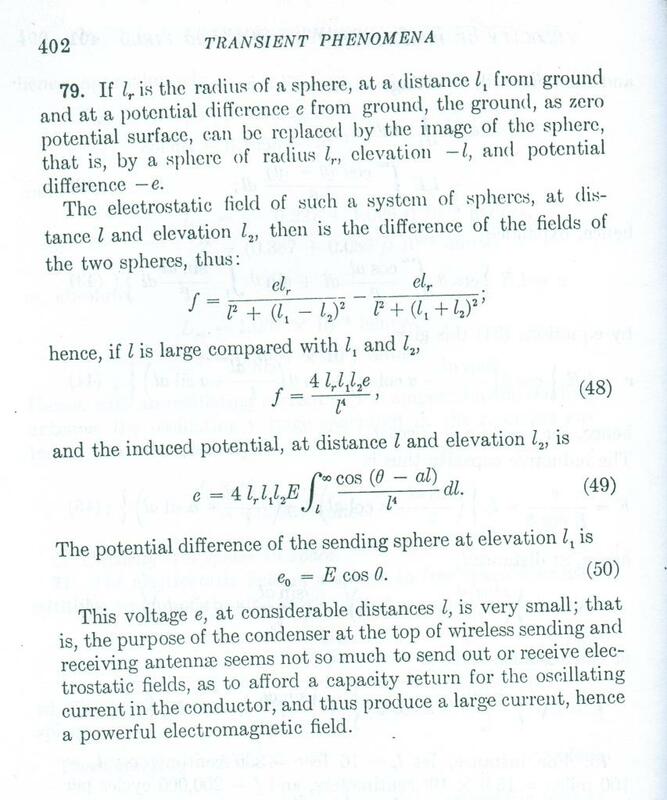 However note that the space versor part is not there , it is at the end of “Theory of Wireless Power”. Fortunately The Dumpsters or Olin Bales of SwinePlanet did not get these. They were 8 years of hard work every day on my part. The entire working Telluric system WAS working at Landers. There WAS your velocity greater than c. It was based upon a navy situation of transmitting direct to deep submerged submarines through water, and through the metal hull of the sub. Anyway the Mojave Research Facility at 57474 Linn Road Landers, is in the hands of criminals. Our Navy is N.F.G. now. 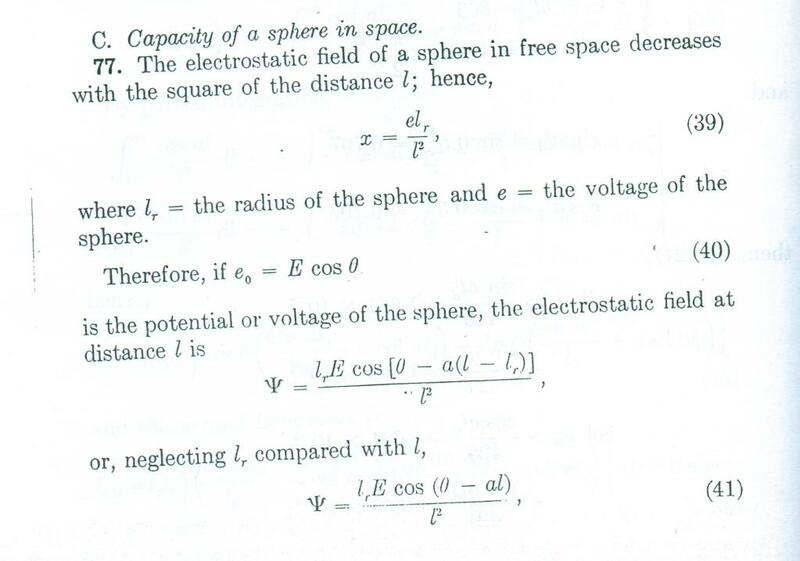 Steinmetz sphere equations in the “Transient Phenomena” book may be of use. The 1920 edition has the right equations. I think your sphere should be driven by a self resonant coil, cut short to resonate with sphere capacity. 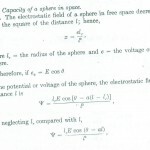 Sphere capacity equal to coil self capacity is maximum sphere capacity allowed. 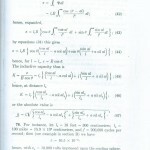 Use my formula in “Theory of Wireless Power”. No guesswork here, just basic high school math. Forget the physics of gobble-gook. 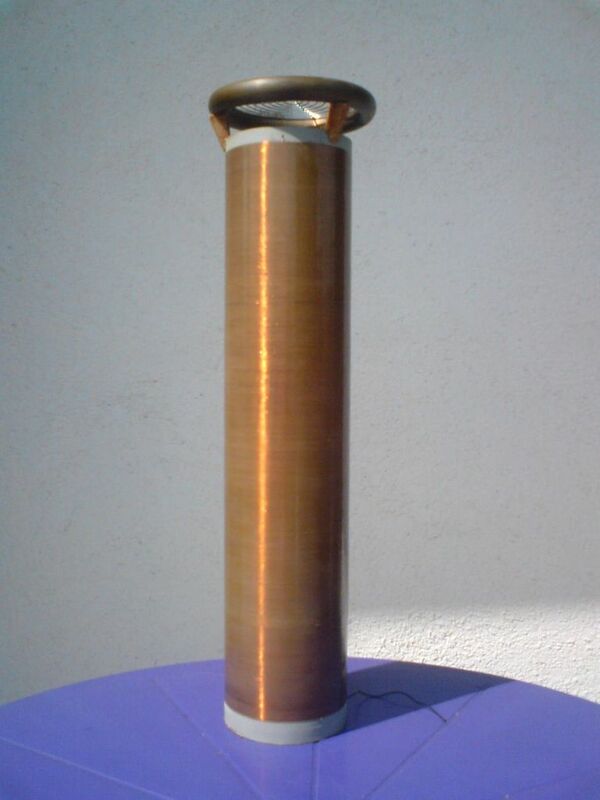 For “Can” antennas if you want what is known as a Transverse Magnetic, TM waveguide mode. Here the dielectric is longitudinal along direction of propagation. See “Radio Engineer Handbook”, Terman, and “Reference Data for Radio Engineers” I.T.T. published. Here your waveguide modes are presented. One in particular is very interesting as its lossed decrease with frequency but it is very hard to excite this mode. Check this out as it is directly regulated to your efforts in “moonbounce”. Show modes on forum for others to see! Also a “Tao” has his own great representation of the “Four Quadrant” “Eight Pole” representation on forum. Just a quick disclaimer here. This is response is from Eric Dollard. Not from me. Eric’s words directly. Eric is “pissed off that people aren’t getting it.” “They are getting way off the track.” “And there’s no legitimate reason for it”.How many turns did Tesla use at Colorado Springs? One- there is a reason for that. It’s only with one turn that you can get the maximum amount of capacitive dishcharge with only one turn. Read the Colorado Springs notebook. 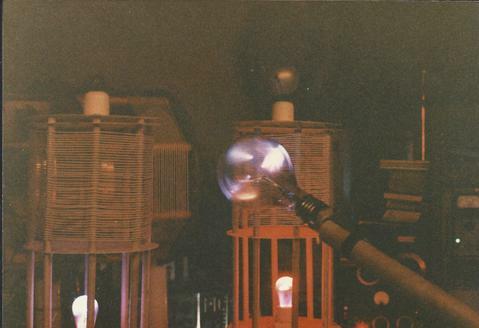 For never building one, why is there a picture of me with a wireless Tesla Transmitter lighting up a light bulb in two peoples hands on the cover of “Condensed Intro to Tesla Transformers”? With no wires! 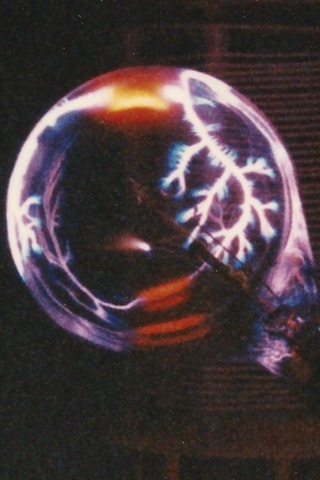 And by the way any idiot can make a Tesla Transmitter out of the information provided in that book. It seems to me there’s a lot of people who need to go back to high school electricity class before playing with Tesla. Don’t bog the world with your miscomprehensions. Below is a response from Eric Dollard. All these words are from Eric, not me. Eric is very interested in your guys’ thread you guys are actually doing something. Eric says this is the least amount of bull****. Also: Eric would like it if you guys could actually post pictures, diagrams, equations, material instead of links to them. So Eric can see these things without having to follow a bunch of links.Ferrite cores ultimately do not really work. Here is how I determined that: If I want to build a 60 cycle transformer to go from 240 volts to 4800 volts no problem. Now let’s say I want to build a transformer with the same voltage ratio at 6 mega cycles, it ain’t happening. What I determined through experiment is that ferrite can carry the self inductance but not the mutual inductance. The audio guys had similar complaints. The navy uses very very fine steel tape(insulated). It seems that its important that the iron have conductivity electrically in the same direction that it is carrying the magnetism inductively. In other words the core conductivity is at right angles to the winding conductivity. At any rate that’s my theory and because of the ferrite I have accumulated quite a pile of transformers that don’t work. You guys are getting into rotating electrostatic generators with cathode ray excitation. (Post # 83 in this thread). Eric would like it if you could show pictures and diagrams of that stuff. You are starting to get into some slight similarities with what Tesla did. There’s some stuff that ties to the old cathode ray theories of Crookes, implemented by Tesla. The cathode ray(beta particle) excites the machine. It turns the electron-volts into potential e(small e deliberately – see Eric Dollard thread on units) I find this quite interesting. And then I found the fluerescent lamp variable capacitor interesting and here’s what else you can do: You can go to your local neon sign shop and often for free the guy will make a short 1 foot tube for you of any gas or arrangement you want. That’s it. 1. Stop using the notion of charge and Q. Use dielectric induction and the greek letter psi. Start using the units he derived. It makes him frustrated to have derived all the units- and then nobody uses them, reinforcing their misunderstanding. Forget everything you know and start over. Start using big E or little e for volts, depending on the context. Use the system of units he derived- there was a reason for him doing 40+ transmissions doing this. You’ve got something special with those laminations in the transformer, something different than normal. Try to make some diagrams and pictures if you can. Alexanderson lays it out in his patents. Need a certain amount of oxidation on the core laminations. Bake laminations and cook them to get a certain amount of oxidation. Check out the patents for more details. That’s one idea. Navy uses alloyed permeable metal tape. Some examples: permavar umetel tape. The phone company uses very fine wire instead of ferrite. The iron wire must be at 90 degrees to the copper windings. If it is used as an inductor you want to put a cut or slit in the iron core windings so current doesn’t flow. If it is a transformer you want to saturate the core so don’t put a slit. With a magamp you want the core to be saturated, ferrite kind of defeats this. Ferrite is a bunch of separate particles in the core that can’t conduct electrically with each other so saturation is difficult. Kind of like an air core. You want electrical conductivity in the same versor axis as magnetic inductivity(flux). But the current in the windings flow 90 degrees to the magnetism flowing in the iron. Right angles to each other. Space Quadrature. While there is actually no current flow in the conductivity of the core, it seems to be a necessity. This may or may not be important with the magamp. However, don’t take my word or theory as a final say on it. Experimentation is necessary. It is possible ferrite may work, so far it is unknown. You must find out for yourself. That machine was designed to do plasma experiments not to transmit, it was a balanced TMT as you said. If you want to build a transmitter for experiments(without transmitting) you need two coils out of phase.Our hands were drawing electrostatic energy off of the two terminals to light the bulb. That geometry was specific for plasma generation, not necessarily what you want for transmitting into the earth. 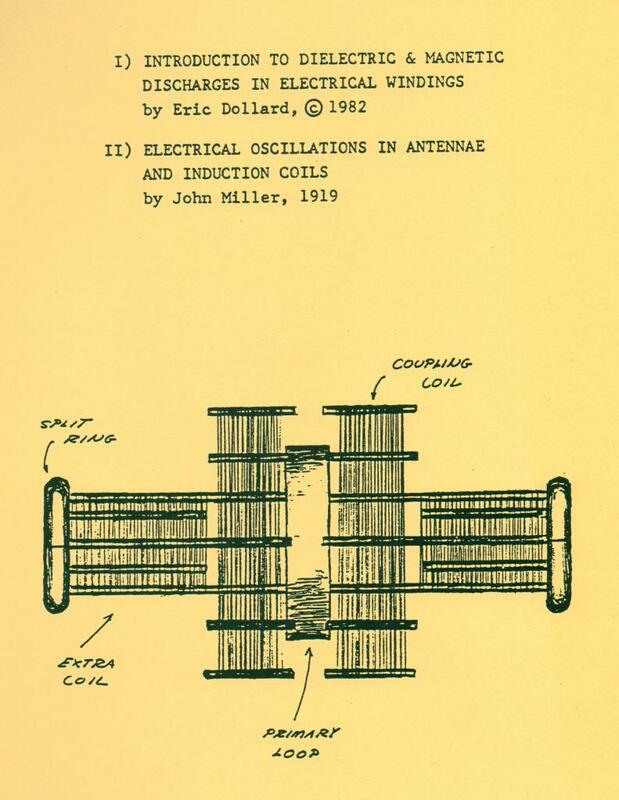 If you want to see how the geometry of the Wireless Tesla Transmitter works you must check the Colorado Springs notes. It has the number of turns, width/height ratio, etc. Taking these you can scale it down to anything you want. My analysis of the Tesla Transmitter (shown in the Colorado Springs Notes) is in Intro to Tesla Transformers. My analysis is not just of the Colorado version, but the Tesla Transmitter in general. Everything is there. Although I must warn you- you need a government license if you want to transmit radio frequency energy. The one in the picture is balanced so it can’t transmit. Can get much higher energy densities this way, so you need to make sure you don’t burn your neighbors house down. If you fired half of the power in the picture shown you would burn something up. It had 1/2 of a mega-volt-ampere of field activity. Wrongly called a resonant circuit with a high Q. It has distributed constants. 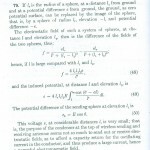 Read theory of wireless power. The power supply we used was a 10 Kw radio transmitter. It was a specially designed radar transmitter in a push/pull scenario. 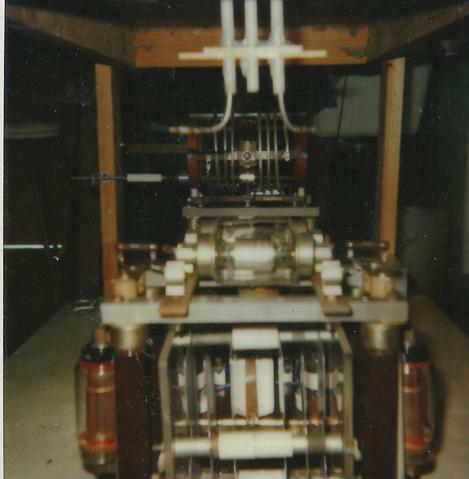 It was a pulsed high frequency radio transmitter. 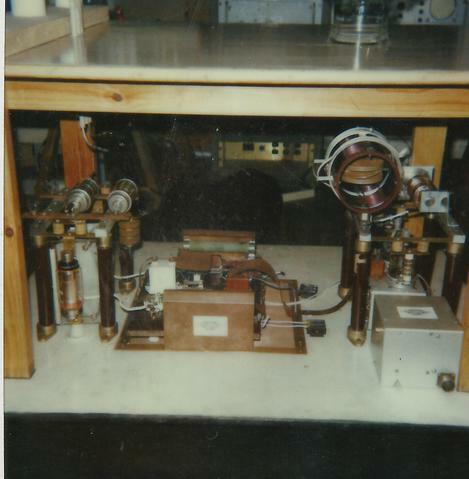 The switching tubes were push pull- a set of 6 Eimac 450-TL hf transmittting triodes. Plate voltage of 6300 volts. Discharges leapt from the of end of the coils to a length of 4 1/2 ft. Total field energy of 1/2 million volt-amperes reactive. 3000 kilo-cycles per second. RCA came in and cutoff the 3 phase power and took all of the oil filled transmormers, so what you see is us just lighting a small bulb in our hands. Don’t try to copy that device, it was primordial. I didn’t have any of the math done yet. Everything I’ve written so far is how to do this right. It’s already been written in this thread and my books. Some of the pieces and pictures I have posted in this thread may seem like disparate pieces of information, but it is all connected. Each is important to the replication of the Tesla Magnifying Transmitter. I’ve given you all the tools. Advice to anyone wanting to get involved building the tesla magnifying transmitter: before you get started go get a ham radio license. Otherwise you shouldn’t be getting involved in this sh!t. You have to transmit on Industrial Scientific and Medical frequencies or Ham radio. Ham radio goes back to my original aim. My first question for you before you start building this is: Why do you want to build this thing in the first place? Are you willing to read the books and do the research required to build it? I’m not going to spoon feed all of you or you’ll never learn anything. My only desire was to develop this technology for the Navy so that they could communicate with submarines, without the subs having to drag long antennaes behind them. 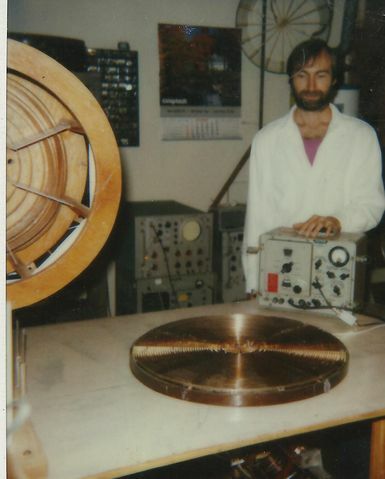 And then Olin Bales ended up with my lab and all my equipment. And now it’s being resold on ebay. I could have predicted the next big California earthquake but now its over and gone. It is extremely unlikely my antenna field will ever be rebuilt. I want to see the first anti relativistic (anti-Einstein) radio transmission. Who is going to do this? WHERE IS LAMARE?? I am going to make a documented case that the Corums ripped off the Army. I could have done way better. I will publish this later. They’re next. Here Tesla was referring to numerology. Take all the numbers in anything in your life (your ph number, address, license plate, etc.) Add all the numbers together, when you reach 9 you start over again (A Base 9 system). For example say your License plate is 134. Add the numbers together: 1+3+4 = 8. So your number is 8. Another example license plate: 568 = 5+6+8 = 19 = 1+9=10 = 1 in a base 9 system. Mind is a little foggy so not sure on the exact details. You will find these numbers will ocurr everywhere in your life. It is an ancient Egyptian thing, called the Chaldean system. Theoretically based on your cosmic “attunement” you will see the numbers occur more or less often. Tesla made sure everything he did in his life was based numerically on the number 3. 3 phase power uses the least amount of copper of any wire line transmission system. The reason why remains a mystery today. Steinmetz attempts to explain it in his AC book. (by the way the Holy Trinity is a popular Christian archtype. Tha father, the son, and the holy ghost). Tesla’s father was a priest. Tesla was supposed to be a priest. 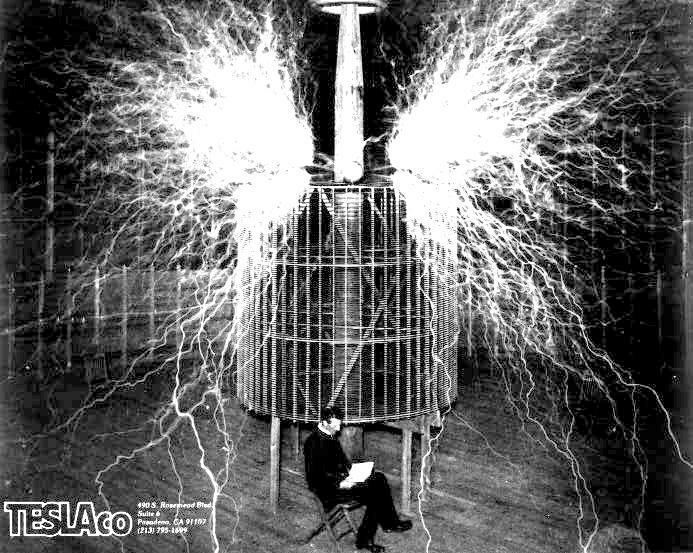 Tesla became a priest of different field – science. 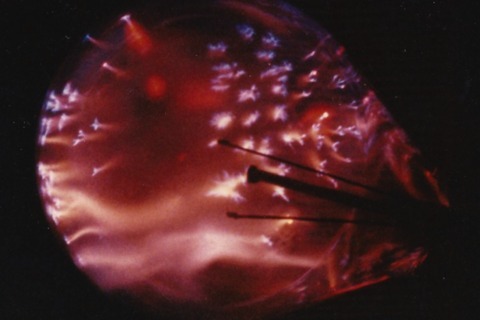 Read opening chapters of J.J. Thompson’s “Electricity and Matter”. However, under the Chaldean Numerology system, it isn’t enough to know what the single numbers mean. One must also know what the “compound,” or “double,” numbers mean is well. 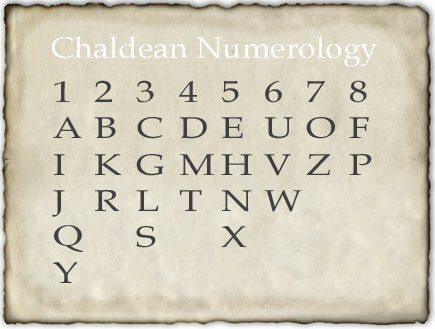 The single Chaldean Numerology number simply represents the physcal outward appearance of a person’s name, whereas the compound Chaldean Numerology number represents the deeper, metaphysical, hidden influences or forces behind the name. In our above example, although the name adds up to the single num*ber 7, the name also has three compound numbers—20 in the first name, 11 in the middle name, and 21 in the last name. In other words, ferrite can carry the inductance of a single turn, however neglects the multi turn inductance? This make sense. However this means that mutually coupled domains are dependent on CONDUCTION???? Does this explain conduction????????? 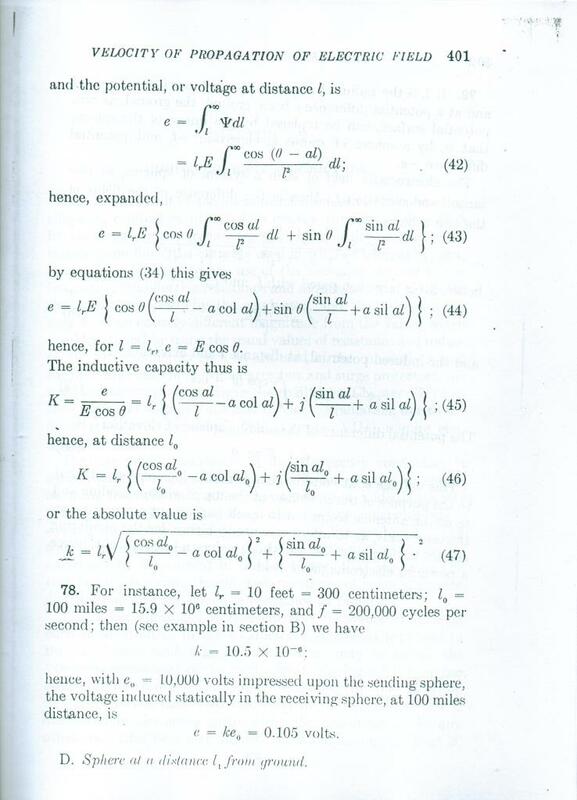 WHAT CAUSES THIS….Where in the equations is this? If it is not there….which is fine, what do we FEEL is responsible? This seems VERY connected to what I show in the cross field capacitor thread. An order of operations for “conduction” vs parameter change? Eric said he has the very same questions you do concerning mutual inductance. No easy answer unfortunately. 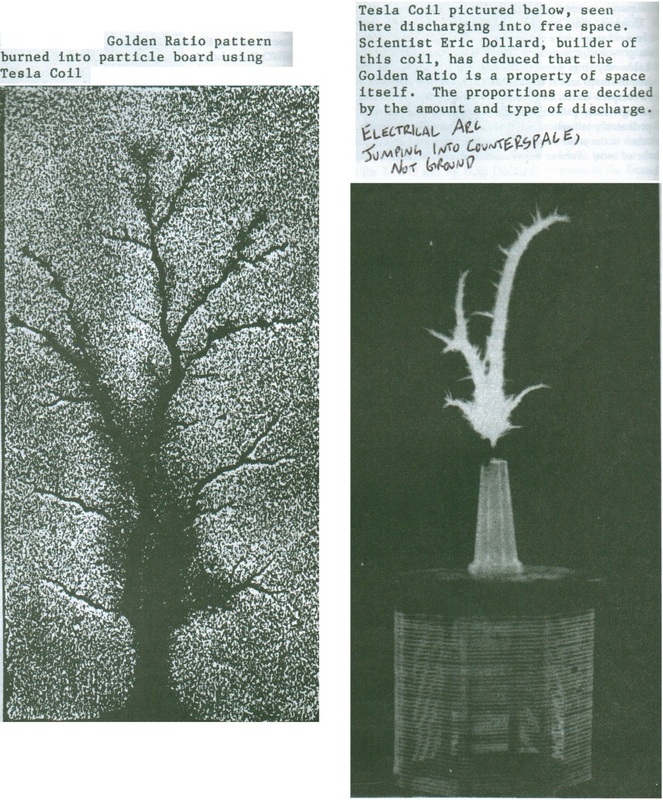 Eric asked me to point out the Tesla coil pictured in the fractal discharge(which Eric built), compared to the original picture of the Tesla coil in Colorado Springs. Look at it and notice the similarites, make a visual comparison. Same number of turns, same width to height ratio. The pictures speak for themselves. 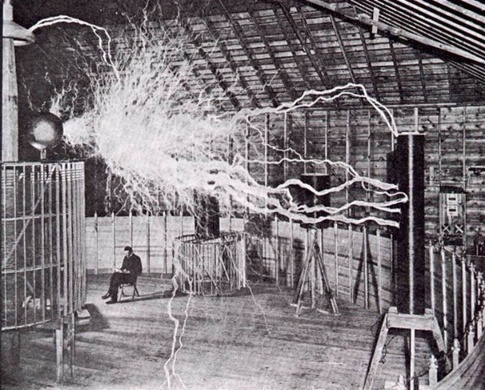 The coil pictured sitting next to Tesla inside the fence is called the main coil, or the “Extra Coil”. The primary and secondary coils are the fence, 51 ft in diameter. In the “Extra Coil” it is critical that the length and the diameter are equal. Notice the tall, slender coils to the right of the picture, we will term them “cardboard tube” coils. 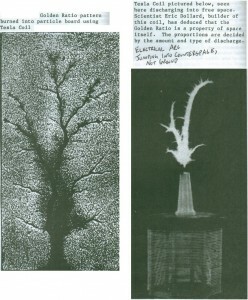 This is a primary source of misinformation about Tesla coil’s existing today. The “Extra Coil” in the left of the picture is the one doing all the work. The Arc Discharges would be there regardless of the “cardboard tubes”. 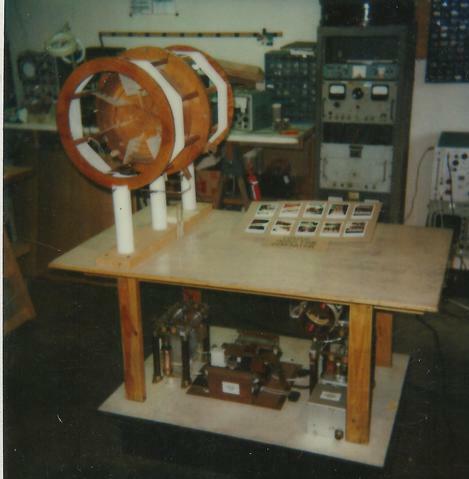 The different height cardboard tubes was Tesla dealing with different frequencies and harmonics, they were called Test Coils. 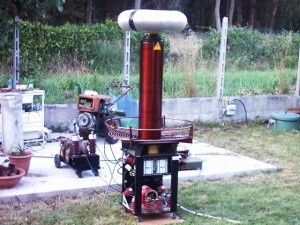 It was a balanced field generator using Tesla Transformers. 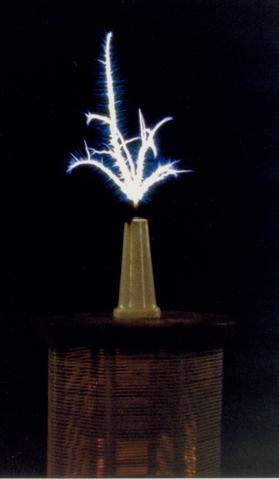 A burned out, incandescent light bulb was held in between the dielectric field of the out of phase extra coils. On page 15 of “Condensed Intro to Tesla Transformers” it is labeled the “area of concentrated flux.” The out of phase extra coils create the central plane of superimposition from which the galaxies emerge. Everything is golden ratio, five phase fractal. This is a blueprint of the coils, all arranged in a line. In the pictures the extra coils are separated, sitting on stands. The diagram is an exact blueprint for the number of turns. The primary details are not easy to see. Only the outside winding of the primary is visible. It was probably 2 or 3 turns, can’t remember. Note zone of cosmic superimposition, the orange “flamey” region this is where the creation begins. Note directly below it a comet is moving from left to right. Directly below that a streamer changing from violet to red in another cosmic superimposition . Hence a plane of cosmic superimposition passes through the center of the bulb. Here is where the galaxies are born. 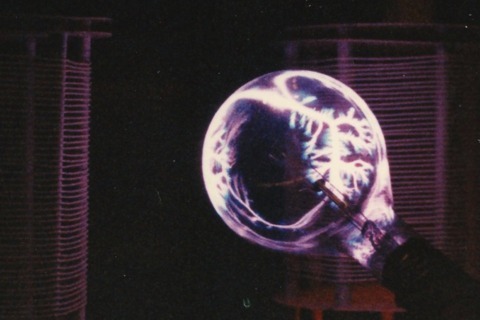 Note the fractal pattern on the glass – no one else’s Tesla coil does this! All the equipment in the photographs were embezzled by George Flores in Los Angeles California. He was someone else that showed up to “help” Eric Dollard. Everyone wants to help “themselves” to Eric. Like the martians in the movie “Mars Attacks” -the aliens were announcing “We are your friends” as they start exterminating the humans. Borderlands embezzled all the funds for the safe place to move the equipemt to. The funds were sent by Josh reynolds. Eric was told “We need the money more than you do”.